Full Price: $ 25.00 20% off! 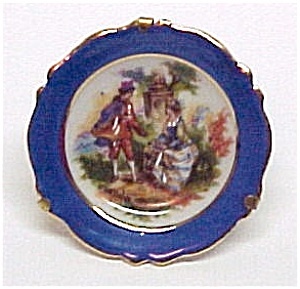 Royal Blue rim with hand painted courting scene. Back is marked Porcelaine Artistique F. M Limoges France. Tiny plate measures 1 7/8 inch diameter, trimmed with gold gilt, sets in stand with ring attached for hanging. No chips, cracks, crazing or scratches. Lovely tiny decorative plate works great in the shadow box.